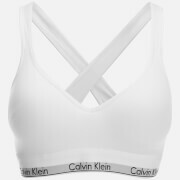 Women's sports bra from high-fashion activewear brand, NO KA'OI. Cut from soft microfibre fabric with a supportive fit, the 'Ola' gym bra is ideal for low impact training. It features a V-neckline and wide, elasticated shoulder straps that criss-cross along the back.